I suggest Ban Hammer and not just removing posts. Gotta take action for it to stop. People need to smarten up. Seriously. IP addresses are stamped on every post they make and people think it is OK to openly discussing illegitimately accessing a carrier database to obtain access to a promotion. People afraid about koodo bumping the price up. They never did that before and I'm a customer since a loooong time. its a migration plan. you cant get it. Already had to remove a couple posts discussing the generator. You need to understand that everyone posting about the generator risks their information being shared with TELUS should TELUS choose to pursue action against RFD. I think Telus' intention is to have people sign up for PM for a chance at the migration offer. Allowing the use of the generator defeats the purpose. Perhaps. The last thing they want is another price war, so this could certainly be a way of avoiding that. Sorry guys, i dont want to invite hate replies, but Can i setup a $10 plan with public and then try moving to koodo? would it work? 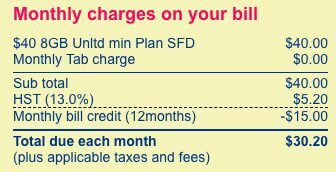 This just shows you how stupidly overpriced all cell phone provider plans are. If they just offered it to all I would bring 4lines over to them. But since I’m not a PM customer I’m screwed. Kinda pissed but that’s the roll of the dice I suppose. Is it $35 with $15 off or is it $35 after $15 off i.e. the $180 in credits? Not a bad idea. 7 day temp ban. If we catch you rejoining under another name, we'll increase it to 30 days. From I have seen so far, you'll only get the migration offer similar to your existing plan. If your plan is $10 with talk and text only , you'll likely get an offer with talk and text only. Does anyone know if I can refer myself? Are referrals per account or Line? If you BYOP it's an additional $15 off for 12 months. So you's pay $20 for your first year. Does anyone know if you can stack this 180 credit with 300 referral credit? You're supposed to start the referral before you sign up for the plan. So would I need to receive the referral link before I order the sim card? Last edited by Zephyr22b on Aug 24th, 2018 3:52 pm, edited 1 time in total. “You miss 100% of the shots you don’t take. -Wayne Gretzky"